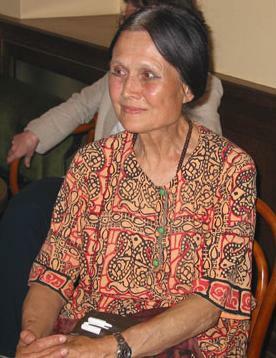 Ilona Ferkova writes in the Romany language, closely related to the ancient Indian language Sanskrit. It has survived and adapted itself through the centuries ever since the ancestors of today's Roma left India a millennium ago. Ilona has written a fascinating collection of short stories that capture both the tribulations and the poetry that shines even through the material hardship of life for many Roma in the Czech Republic today. Here are the opening lines of a moving and disturbing story, The Rolling Pin, set in 1960s Czechoslovakia. Julka lay in bed thinking about her newborn child. It had been a difficult birth and had lasted all night. But with the break of day, the little boy came into the world. Now she felt good and was waiting for them to bring the child for his first feed. She had four older children at home - two girls - Mana and Zuzka - and two boys - Laci and Palka. The little one she called Julecek. "Mrs Gombosova, come to our office, the doctor would like to talk to you," the nurse's words jolted Julka from her dreams. "Has something happened?" Julka leapt out of bed. "Don't worry, the doctor will tell you all about it," the nurse said. "Come in and sit down," the doctor summoned her inside. "What's wrong with the child?" Julka cried at the doctor. "Is he alive?" "He's alive, he's alive, keep calm. It's just that he was born with a dislocated leg. We want to help him, but he'll need an operation." Julka nearly fainted. She burst into tears. "Don't cry, we'll do all we can to make sure he is alright. They won't bring him to you for you to feed him; it'll be much better if we take him straight to Prague to the clinic." The doctor took Julka's hand and reassured her. "Can I at least have a look at him? I haven't even seen him yet," she asked the doctor through her tears. "Come with me, have a look. There are excellent doctors in Prague, they'll help him." The doctor took her into the room where the baby was lying. "Look what a fine boy you have," he showed Julecek to her. Julka began to kiss his hands with tears running down her face. The doctor showed her the little boy's leg. It was completely vykroucena. Julka cried even more. "Don't cry. Everything will be alright, we just have to operate as soon as possible," the doctor said, and sent her back to the ward. Julka was kept in hospital for five days. The whole time she prayed to the good Lord to help her little one. After five days they sent her home. 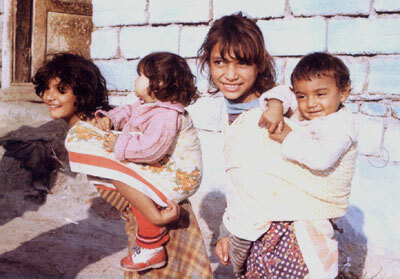 At home her husband Feri and the four older children were waiting for her. They all cried for the little Julecek, but what could they do? Julka tried to hide her pain from her husband and Feri tried to hide his pain from Julka. Three months later they invited them to the hospital in Prague. Both of them. The director said that the operation had gone well, but he also asked whether they would like to have the baby put in a children's home. The story is based on real experience of Roma in the 60s, when it was taken for granted that Roma needed to be "assimilated". In an appalling exercise of social engineering, the authorities believed that they could best serve people like Julka and her child by separating them and sending the child to an orphanage. Society was deeply "institutionalized", and to some extent still is. 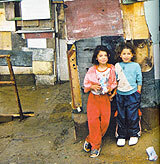 To this day there is a disproportionately high number of Roma in children's homes, prisons and other institutions. 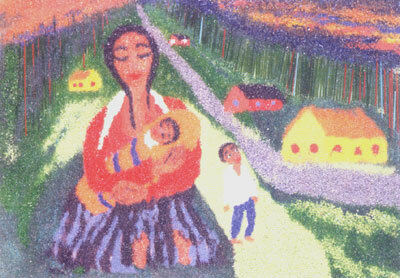 Here is the scene, later on in the story, when the inevitable happens; people from the social services come to take Julecek away from his mother. "Now listen," said the second woman in a sweet voice, "you know the child would be better off in a children's home. Don't be afraid, they'll look after him properly there, better than you can." That was the last straw for Julka. "So you've come to steal my Julecek? Get out of my flat!" She marched over and opened the door. She was still holding the rolling pin that she'd been using to roll out the pastry when the gadzo [non-Roma] had come in. Pointing with the rolling pin she showed them where to go. The gadzo ran out at full speed, without even stopping to shut the door, and Julka slammed it behind them. She picked up her little boy from the floor. "Don't cry, sweetheart, I won't let anyone take you!" And she kissed his tiny eyes, hands and feet. When Feri came home she told him what had happened. "You should have hit them with the rolling pin!" Feri said angrily. "Just as well you didn't. They'd have had you locked up..."
A week later they got an official letter, summoning Julka to the police station. The world went dark and her head began to swim. Feri sighed. "You'll see, they'll make us move on again!" When the police started at her, Julka's eyes flashed with fury. They say I wanted to hit the gadzo with a rolling pin: Assault on a public officer. "We lived our own lives. We weren't like Czech children - we didn't have after-school activities and things like that. Roma children all played together in one street. We would go and play there with the ghetto kids. "We all spoke Romany, our Czech wasn't very good. When we wanted something we had a sense of distance, we always felt they wouldn't accept us, they don't want us. We took that for granted. "We never even dreamed of going to school - of staying on after primary school. We were conditioned into thinking that we'd go straight into the factories, or become cleaners. We didn't even talk about it with our parents. Today children have their own ideas. When at school they asked everyone what they'd do when they left school, I just said, 'I'll go out and work' - the teacher laughed, the Czech kids laughed - it was as clear as anything. "At fifteen I went to work at the factory. I went to wash dishes. I didn't enjoy it because there were lots of dishes [laughs]. I was there six months. Then I went to work at the slaughterhouse. I didn't like it. Why do we do the worst jobs? Why can't we work in offices and schools too? "I realised that we'd have to learn. But our parents couldn't help us. My mother couldn't read and write, father only in Slovak. He'd only gone to school in the winter. In the summer he used to tend the geese. He had been bright, and could read and write. But once I got past the basics, he couldn't help me. "But I always had the gift of the gab. I was a great listener. I loved recounting what people had told me. We used to go down to the Gypsy ghetto - people would talk a lot there. When the old people got together in the courtyard, drank beer and played music, they started telling stories. I loved listening to their stories." Until about 35 years ago no-one in the Czech Republic would have thought of writing in the Romany language, although it had always been the language of Roma across Europe. Officially it was considered a barrier to assimilating the Roma minority into socialist Czechoslovakia, and Roma themselves had always thought of it as a language of speech and song rather than the written word. Ilona was persuaded to start writing by Milena Hubschmannova, who has devoted decades to keeping the Romany language alive in the Czech Republic. "I didn't really start thinking about it until I founded a music group with some other women. There was one song in Romany we sang. Milena really liked it. She said it was real. She asked me who had written it, and I said - me. Milena encouraged me to write. But I'd never written. I'd taught the song by repeating it to the other members of the group. It was strange, very strange, to write in Romany. It was strange to be putting down what I said. It was even a slightly unpleasant feeling. When I read it back I said, 'It sounds odd.' We weren't used to the written word. But I read it again and again - and thought - 'this is really nice.' It depends on the tone you give it when you read, it depends on who reads it." This need to keep the language alive has become increasingly urgent. 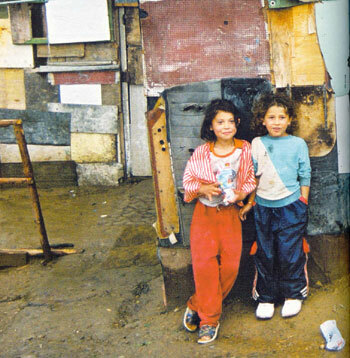 Since the early 1970s Romany has been in rapid decline in the Czech Republic. "People of my generation were beginning to have children. At the time everyone said to us, 'Speak Czech with your children, so they can get on in life. If they speak Czech they'll do well at school.' They hammered this into our heads. We felt that we hadn't had a chance, but at least our children would. We thought - if our children are going to school, the teacher won't speak Romany - he won't understand what she wants, so we started to speak Czech at home with our kids - including myself. Because we started speaking Czech, our parents learned Czech from us. Otherwise they wouldn't understand their own grandchildren. This was a big problem for my father and mother. "We made a big mistake in starting to talk Czech at home and everywhere. Romany began to disappear. When the children were teenagers we would still speak Romany at home - my husband and me and my parents - so the children came to understand it. But they couldn't speak it themselves. Sometimes they'd put Romany endings on the end of Czech words - so they'd say things like: 'turn on the electricos' - because 'os' is a Romany ending." "Betka, can that really be you?" she hears behind her. She turns round and sees a Roma guy. "Aren't you Betka from Michalany, Kacanaca's daughter?" "I am,", she says, but I don't know you." "You don't know me any more, you were just a little girl when I left the village. You're just like your sister Helena, I knew right away who you were. I'm Khandis. I haven't been home for ten years. But what are you doing here all on your own, Betka, so far away, out in the big wide world?" "I've come to work. I've got everything sorted out, I'm starting tomorrow," Betka lied. "And at home they know you're here?" "Hey, you keep your questions to yourself? That's my problem, it's none of your business," Betka says, her anger rising. "Now listen, girl: Prague isn't a village like back home and a girl like you, who's seen nothing but woods and fields, will be swallowed up by the big city just like that, as if she'd never been! I bet you don't even know where that factory of yours is! And if you want to go there, I suggest you wait till morning. They'll all be gone by now. And where are you going to sleep in Prague, if you don't know anyone here?" "I don't care. I can stay at the station and go there tomorrow. Listen, I'll tell you another thing: I may be from the country, but take a good look at me, if you haven't already! See? I've got a mouth, haven't I? I can ask the way, can't I? "You've a sharp tongue!" laughs Khandis. "Look, what will you do if the cops turn up, what will you tell them? You've got no work and on top of that you're from Slovakia! They'll send you straight back to where you came from! If you want, you can come with me. I live near here and tomorrow I'll bring you to the factory. Don't worry, we're from the same village, so I should help you, shouldn't I? So, you coming?" "Okay, but promise you'll take me to the factory in the morning." "Betka, may God punish me if I'm lying! ", he said, and raised two fingers to the heavens. He took her bag and they left the station. A good thing that he lived near the station, as Betka's shoes were killing her. "We're here," Khandis points to a house that's half collapsing. Betka burst out laughing. "Your heart's of gold, but a bomb's fallen on your house! Even our shack in the village is better than this." "Don't laugh, at least now you can see how we live here in Prague! Don't kid yourself that pigeon pies will just fall into your mouth! You'll be just longing to go back home to Mama! Wait a minute. I'll bang on the door to see if Bangi is in." "Bangi, it's me, Khandis. Open up!" "I'm coming, Is the place on fire or something?" they hear from behind the door. Betka almost turned to stone when she saw who opened the door. She hid behind Khandis. "Who is it? She looks like she's just been dragged up from hell!" she said to herself. "Come on in, Betka, don't worry! Bangi may look like a witch, but she's a heart of gold" Khandis said, and put his arms round Bangi. Ilona Ferkova is one of a growing number of Roma writers today, some writing in Romany, some in Czech. She is optimistic about the future. "I got a letter from a prisoner in Valdice Prison who somehow got to see my book. He wrote, 'Madame Ferkova, your story could have been about my own family, and I read it with tears in my eyes. Thank you for giving me the opportunity to read it in Romany. Please send me anything else you might have written.' I was delighted. It had captured his heart." One of Ilona Ferkova's daughters - also Ilona - who is now in her twenties, has not only gone out of her way to relearn the Romany language that still comes so naturally to her mother, and she has even started writing her own poetry in the language. But her own four-year-old son does not yet speak any Romany. "Roma must read and write. The young generation is returning to the Romany language because they're singing Romany songs - in modern rhythms but with Romany texts. Today I hear the kids speaking Romany rather than Czech. They don't speak it all day, but more and more." Unfortunately, Ilona's collection of stories "Corde Chave" - The Stolen Children - has so far only been published in a bilingual Romany-Czech edition. But there is a chance that some of her work will appear in translation next year. We'll keep you posted. Books for this programme supplied by Shakespeare and Sons.